Members from the junior section of Alnwick Harriers at the Lindisfarne campus. Proposals to flatten a middle school site in Alnwick this summer have been put on ice until a full review of alternative facilities is held. All the buildings on the Lindisfarne Middle School plot, including the well-used sports hall, were due to be knocked down after the school shuts for good in July. The previous Labour administration at Northumberland County Council had said it was working to find suitable alternative accommodation for users of the sports hall and annexe, which houses the Adult Learning Service, among other groups. But one of the users, the junior section of Alnwick Harriers, was not convinced and started an online petition to oppose the demolition. Alnwick Town Council put its weight behind the objections at its last meeting in April, with an outraged Mayor Alan Symmonds describing it as an ‘act of civic vandalism’. 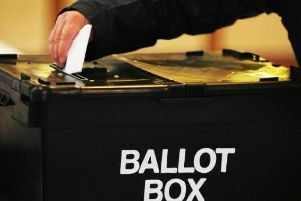 Now, after the Conservative Party swept into power at last week’s county election, Tory councillor Gordon Castle, who represents Alnwick, has stepped in to put a block on the plans. “I have told the officer responsible for this area that we need to pause to have a full-scale review of sporting and adult further education needs and facilities,” he said. “In my opinion, there is a case for demolition of the new part of the school to prevent vandalism, but not the old school and the sports hall. “This is not going to be kicked into the long grass, but there is a new political landscape and we are not in a hurry to get it wrong – all stakeholders must have a say. Mike Telfer, for Alnwick Harriers juniors, said: “We are pleased to hear that the community facilities at Lindisfarne are safeguarded in the short term. These are vital facilities for the district, especially for junior sports teams in the winter and for sports that require large, robust courts. “Maintaining further education facilities are also important for the wider community and it is a relief that common sense has prevailed. Before the election, the county authority had said that options for future uses were still being considered.